So, here's the deal. I don't know if I shared here that I signed up for an adult Jazz/Tap class. Mind you, I have never taken a dance class in my life, so this was kind of crazy, but something I've wanted to do for a really long time, so I just DID IT! Wellllllll.... last night was my first class. I'm terrible. HA! BUT, alas, it was WAY fun and it's something new AND I'm totally hoping I get better because, well, I'm not sure I can get much worse. The shoes, however, those totally ROCK!!!! For REALS! Just sayin'. Today I have another fun New Year's card to share with you using some super fun brads from Eyelet Outlet and another great SRM Sticker sentiment! Love those things! This one is kind of fun! I started out with a black card base and rounded the corners. I then added the Martha Stewart decorative tapes, these are thicker than washi tape, but I still love them lots and lots. I cut a tag, rounded a corner, and stamped the 'rays', adhered the brads, and affixed the sticker. I actually used a silver Sharpie to create that cool silver border around the tag to match the border already on the sticker. I LOVE how that part turned out! I added both the Gold Shimmer and Platinum Shimmer twines from The Twinery and then tied the little bunch with some awesome silver string from May Arts! Silver and gold can be really fun colors to play with! I am also linking this card up to the fabulous CASology 'New' Challenge! New dance class, new year, new fun products.... there's lots of new going on, isn't there?! Well, now that's just FUN! 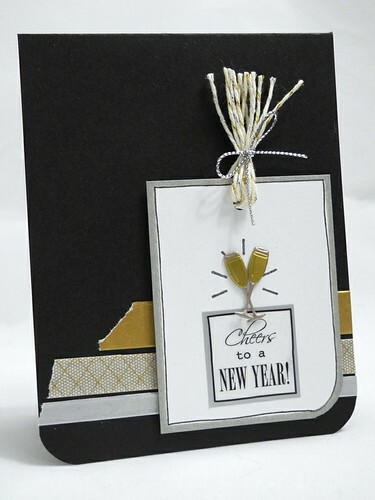 Oh...and don't forget to check out the Eyelet Outlet blog today for some more fun New Year card ideas! I hope you have a super stupendous Friday, folks! Love your card! Happy Friday!!! that is awesome that you signed up for the class!! how very fun- i did something similar in november and signed up for a tennis class- i love it and and i reupped for the 2nd session - it starts again this sunday! i am so excited and i have my first match in 3 weeks. i can't wait!! so glad i tried it!! Your dance class sounds so fun! Love your card! Super cute card and I hope you had fun in your dance class!!! YAY! Souns like so much fun! And I LOVE your card! Hugs! what a fun card..love those eyelets and all the gold and silver..great card. Great card! It's happy yet elegant :) Love it! good for you for signing up unknown! FANTASTIC card!! LOL. I hope it works out well for you. It sounds fun! Great card. So happy and cheery and perfect for new years! Really? I totally see you as a dancer! Glad you're having a ton of fun. I used to tap as a little girl. LOVED the shoes!! Awesome card, too. I love how you combined gold and silver. I wouldn't think to do that! First, I think you're AWESOME to take a dance class - good for you! Fun and healthy - you inspire me! Second, I love this fun card - those brads are perfect! Thanks so much for playing along with us at CASology this week! Love the colors and those little glasses! Kudos for trying something new! Cool card too. What a FUN New Year's card! Love the fun tape you've used here! Beautiful card. Have fun with the dance class. My dd has taken dance for 6 yrs and they offer adult classes, but there is no way anyone is getting me in there. none. Hey Jennifer, I emailed you on Monday about a guest DT spot but haven't heard back from you yet. Just making sure you got my email! Love how everything pops off the black card base. And those brads are adorable! Thanks for playing along with CAsology this week! 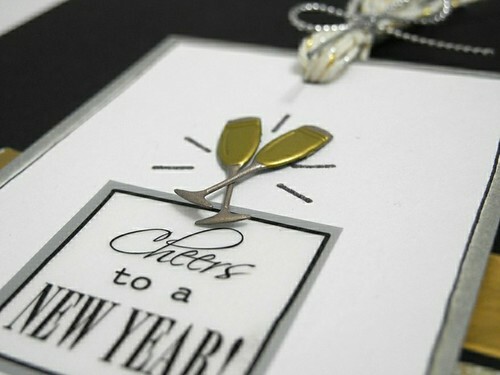 Jennifer your card is so much fun for new year's, love the champagne flutes. Thank you so much for sharing with us this week at CASology! I love the strips of tape and fun bakers twine :) Thanks for playing along at CASology! Great card love how you did around the edge with a sharpie really clever..